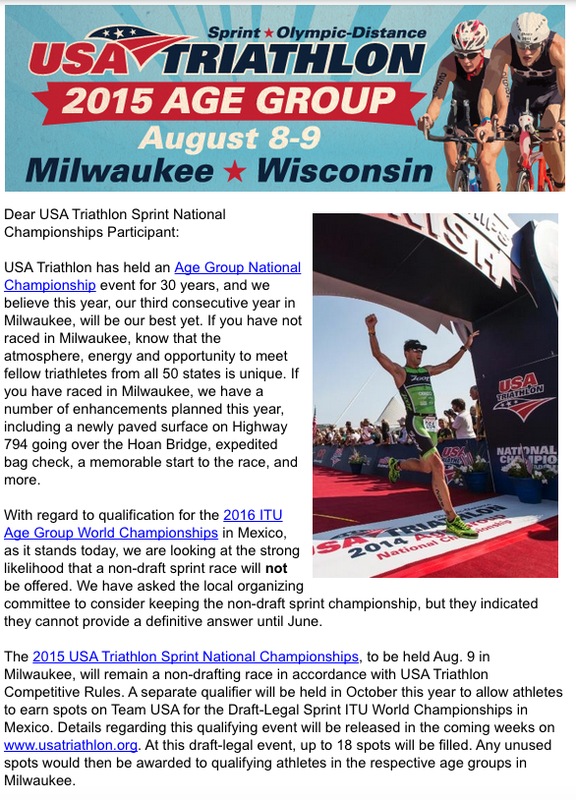 If you plan to race at this year's USAT Age Group Sprint Nationals, be aware that it is no longer a qualifier for the ITU Age Group Sprint World Championship. 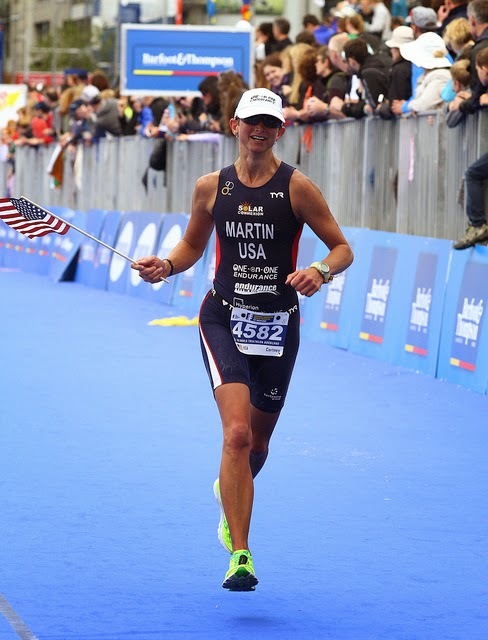 During my four years participating in the USAT Age Group Nationals weekend, there have always been two races: the Olympic distance on Saturday and the Sprint distance on Sunday. They varied in that one had to qualify for the Olympic race, but not for the sprint, but BOTH races were qualifiers for the ITU Age Group World Championship in their respective distances. 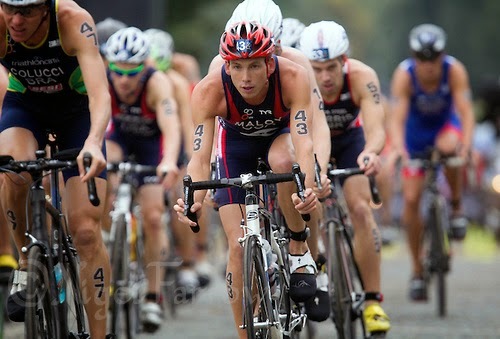 I've enjoyed racing both and having two opportunities in one weekend to qualify for Team USA. In non-drafting (draft-illegal) racing (again, most all age group races are this way), one must stay out of a 3m x 10m (or 12m for long distance events) "draft zone" around fellow cyclists on the course, except during a pass which must be done within a specified amount of time (I think 15 seconds). This is to minimize the advantages of "drafting" whereby the rider can save up to 40% of their energy riding in the low pressure area created just behind the rider who cuts through the wind. That's me riding safely in the front of the photo from last year's Nationals. Non-drafting racing maintains the focus on the individual nature of the sport. Yes, one can draft somewhat in swimming, and theoretically on the run (not with much advantage) but in cycling it really changes the nature of the race. In draft-legal racing, riders form closely grouped peletons or packs, adding a whole new dimension of race tactics and strategy. Because the drafting advantages come from riding very closely, the risk of multi-rider crashes go up significantly. A clipped wheel, a moment of inattention, a sudden move by a rider - that's all it can take for you and your cycling neighbors to go down hard. The young professionals who race in ITU draft-legal racing are skilled and accomplished and can ride far more safely than us. But the bike handling skill set among us "weekend warriors" is varied. How many of us who are beyond our 20s and 30s, with jobs, and families, and responsibilities, want to participate in draft-legal racing? I'd argue not many! Certainly not me. I train for my best INDIVIDUAL effort out there! I'm not interested in the gamesmanship, false advantages, and strategies of pack riding. The other point to make is that the triathlon/TT bikes we ride in draft-illegal racing are not permitted in draft-legal racing. One needs the ready-access of shifters and brakes of a road bike for safety purposes and quick adjustments. So if you are interested in both styles of racing, you'll need to keep up two bikes now. 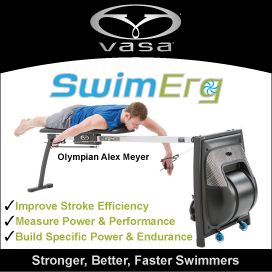 And if you should qualify for both the sprint and Olympic Age Group World Championships? Be prepared to take two bikes if you want your TT bike for the Olympic. One of the things I love most about this sport is it's inclusivity throughout the age groups. I love racing at Nationals and Worlds with athletes in their 60's, 70's, and 80s. Often the upper age groups are MOST competitive at the sprint distance, and if the only World Championship racing opportunity is draft-legal, how many will want to compete? I feel this rule change discriminates unfairly against the upper age groups! 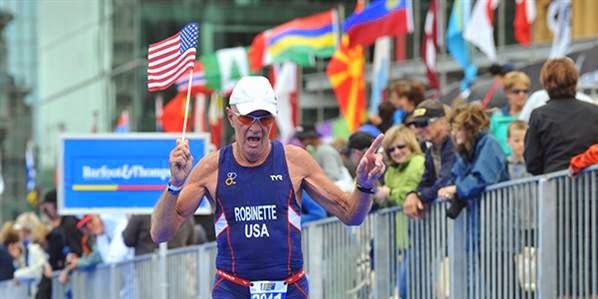 I know some of the top athletes in the 70+ age groups who are superstars at the sprint distance but for various reasons simply cannot compete at the Olympic distance. It is my understanding that USAT and other national federations do not support this change. They have proposed that a non-drafting sprint worlds be offered but that isn't looking very promising. For now the ITU decision stands. 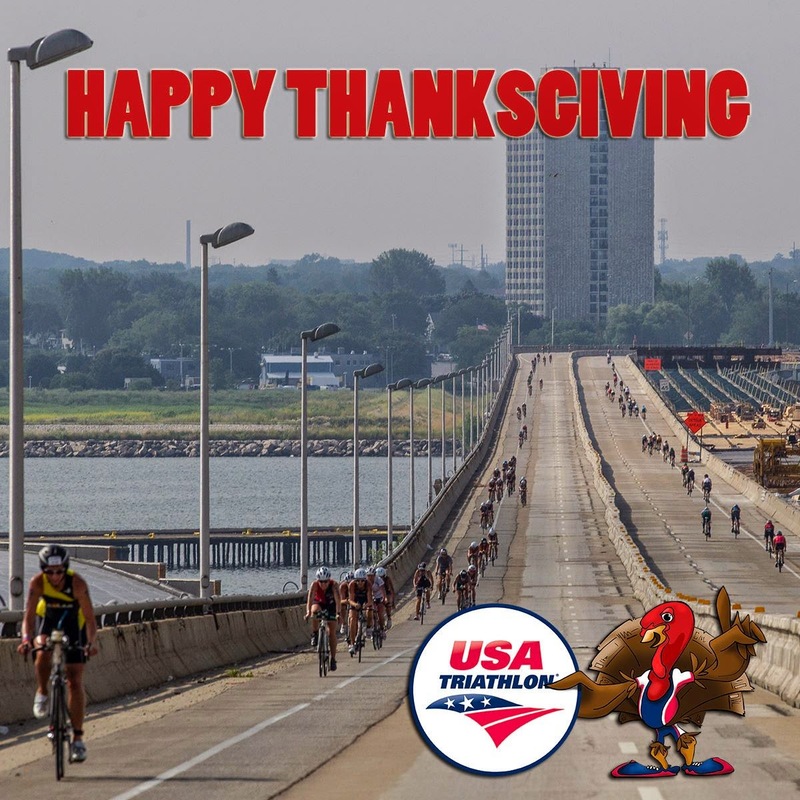 USAT announced that it will hold a special qualifier in October for the 2016 draft-legal Sprint Age Group World Championships. So now rather than the expenses of one travel weekend to qualify for two races, now there are two separate travel weekends. But not for me, since I am not at ALL interested in draft-legal racing. I am even on the fence about whether I will race the 2015 non-drafting "Sprint Nationals" which seems less "Nationals" and more just "regular race" since one need not qualify for it and it qualifies us for nothing. In summary, if the ITU wanted to offer BOTH a draft-legal and non-drafting Sprint Age Group World Championship, I could support that. But switching the Sprint distance to ONLY draft-legal is crazy. They claim this change is to become "more inclusive globally?" I'd argue it discourages participation particularly through the older age groups. 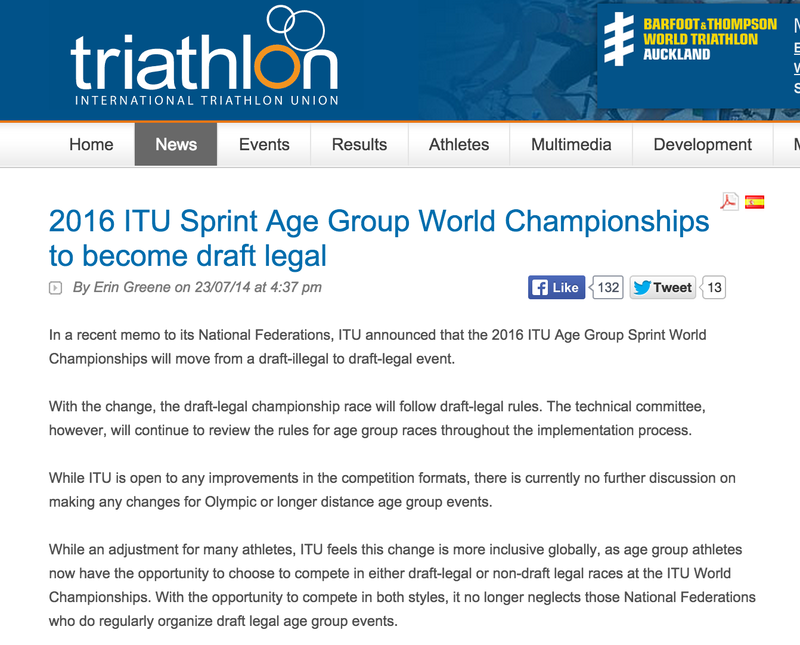 I hope the ITU will reconsider its decision and continue to offer a non-drafting Sprint Age Group World Championship. Thank you to USAT for continuing to pursue change and solutions and for listening to and responding to our concerns!